Do Your Own PPC Audit - Beasley Direct and Online Marketing, Inc.
Pay-per-click (PPC) advertising is a moving target. Knowing how to do your own PPC audit gives your business a competitive edge few others have. The competition to attract web users is constantly changing, having an impact on where you can and should advertise and how much you should pay. Your own products, promotions and marketing strategies evolve. This requires the creation of new campaigns. And of course the search engines themselves regularly change the playing field. Those changes keep offerings fresh and thwart marketers who try to game the system. All these are good reasons to conduct a regular PPC audit on your Pay-Per-Click advertising. In this Hands-On Guide we’ll show you what to look for, and also walk you through improving two of the major areas that most audits identify for improvement: Quality Score and Ad Extensions. 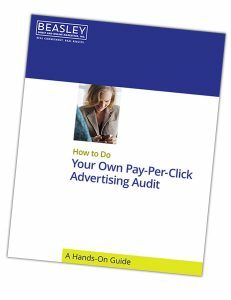 Just complete the information below for instant access to your free copy of our hands-on guide, How to Do Your Own Pay-Per-Click Advertising Audit.